The restaurants in Krakow are largely aimed at tourists, with promotion girls often employed to entice people in of the street, however with a bit of research, like our list below, compiled from our own reviews together with those from Michelin and Gault & Millau Polska, you can find some fantastic restaurants serving some of the best food in Poland. Most restaurants in Krakow open every day of the week for both lunch and dinner. 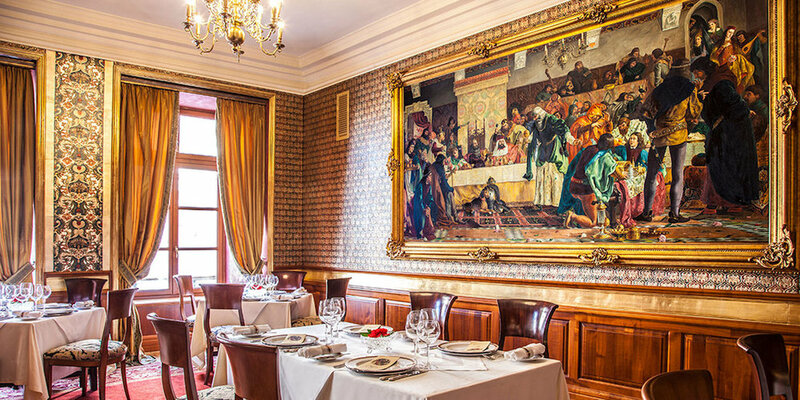 This small renaissance inspired restaurant inside the posh Copernicus Hotel, on the historic Kanonicza street, offers a menu based on Polish royal cuisine. Chef Marcin Filipkiewicz delivers a menu of traditional Polish recipes interpreted in an innovative manner using the likes of mushrooms, quails, crayfish, asparagus and other precious products. A five, seven or twelve course Tasting Menu is served in the evening, whilst an a la carte option is available at lunch. Enjoy drinks on the roof terrace upstairs beforehand. Previous diners include Prince Charles and George W Bush, presumably not at the same table. Impressive award-winning restaurant inside the Queen Hotel, ideally located between the Old Town and the Jewish Quarter. Innovative internationally inspired dishes are created with the freshest, seasonal ingredients, the menu changing every 3 months, with a brilliant 7 course Tasting Menu highly recommended. It's incredible to think that Head Chef Michał Cienki is only 26 years old!!! Opened in August 2016, the "Grey Goose" on the main Old Town market square has quickly established itself as one of the best restaurants in Krakow. Whilst the decor is simply stunning, the modern Polish menu is also impressive, largely focused around poultry dishes with the stand out dish being the signature goose egg shaped 'Szara Gęs' dessert, a must-try when here. From the same group behind Copernicus (above), the impressive 3 Rybki restaurant on the ground floor of the plush Hotel Stary boasts a vaulted stone ceiling and dramatic flower arrangements. The historic renaissance rooms with their vaults and ornate Gothic windows contrasts beautifully with the modern dining rooms. Translated into English as "Three Fishes", you will not be surprised to learn that Krakow born Masterchef Krzysztof Żurek's traditional seasonal Polish menu is largely seafood based and accompanied by a great Italian wine collection, from where he takes much of his influence. In the summer, a rooftop terrace overlooking the square offers a great place to dine. Split over two small floors of the Kanonicza 22 hotel and boasting tapestries and a garden, this wonderful restaurant literally translates as "under the nose", as it is directly below Wawel Castle. Chef Przemyslaw Bilski gained his experience in London Michelin-starred restaurants Zafferano and Locanda Locatelli, as well as Krakow's Copernicus next door (above). His seasonally changing menu is Polish with International influences. Hidden in the cellars underneath the bistro and delicatessen on the Royal Road is this excellent fine dining restaurant and wine store, which also boasts a hidden cocktail bar and cigar room. A choice of Tasting Menus combine unconventional dishes with original Polish cuisine. An excellent sommelier is on hand to help you choose a pairing from the extensive cellar, including those from fifteen Polish vineyards. Located in the 500 year old mead cellar of a former tenement-house built within the Northern part of the city’s fortifications. Tapestries and antiques decorate the lovely cellared room and there's a lovely enclosed terrace at the back of the restaurant. As its name suggests the Polish meat and fish menu is French influenced. Opened in April 2016, opposite the Klasztor Ojców Dominikanów church, this seafood restaurant boasts a large wine cellar and pairs each of its fine dining food with recommended wines. On entering the nicely designed dining room, you pass a lobster tank, reminding you how fresh the produce is here and there's a huge choice of lobster, fish and oysters on the menu. 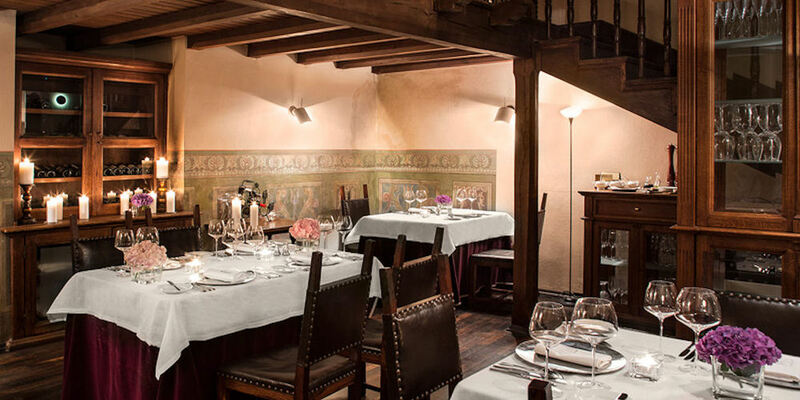 This grand historic restaurant, with its stunning 15th Century dark wooden ceiling, offers wonderful views of the the market square from its first floor location inside the 4 Star Hotel Wentzl. Dating back to 1635 and now owned by TV chef Magda Gessler, it offers a more formal approach to Polish dining with its white table cloths, polished parquet floors, coloured pheasant feathers and thick curtains. This popular family-run restaurant is located on the main square and offers an outside terrace that is normally packed full of tourists. If you can grab a table inside though, you will be rewarded with an ornate hand-painted Gothic ceiling and a vibrant atmosphere. Reflecting the owner's heritage, food is a mixture of Polish and Swedish with some fantastic soups and great steaks to choose from. The restaurant of the 4 Star Hotel Rubinstein in the middle of the Kazimierz Jewish Quarter offers Polish and Jewish cuisine in both the ground floor restaurant and downstairs cellars, as well as on the furnished glazed patio on the vibrant square. In the summer, a rooftop balcony offers romantic dining with stunning views and live klezmer bands perform for the diners in the evening. This modern restaurant close to the train station, from young local chef Tomasz Binieda, serves up seasonal dishes made with locally sourced products. It offers a fresh approach to the more traditional dining options in Krakow. This popular restaurant, just off the Royal Mile and close to the Main Square in the Old Town, showcases the cuisine from the Galicia region of East Poland and West Ukraine. The extensive menu specialises in duck and goose dishes and an enclosed open air summer terrace adds to the offering with live piano concerts. If you're looking for a healthy meal, then this neighbourhood restaurant close to the cool Międzymiastowa area of bars, is the place for you. A real hidden gem, accessed through a pretty garden, as its name suggests, "The Green Cuisine" serves delicious meals made using only the finest selection of vegetables, fruit, organic meats and grain products. Closed Mondays. For some fantastic modern food in a completely different environment, you should head to this former bus garage. Oskar Zasuń's innovative monthly changing international menu is served to the soundtrack of live piano music, whilst the bright sunshine from the folding glass garage doors shines upon the exposed timber roof and black linen tables inside. Named after a legendary feast held by wealthy merchant Mikołaj Wierzynek in 1364, this historic restaurant overlooking Krakow’s Old Town Square is famed for its legendary eight rooms, each continuing the medieval theme. The beautifully presented but expensive Polish dishes attract a loyal local following from a more upmarket crowd, together with a whole host of visiting celebrity diners. Probably the only Corsican restaurant in the whole of Poland, this nautically themed seafood restaurant uses Polish products in its huge menu of dishes inspired by the French Mediterranean island. Located down a quiet alley not too far from the main square. Specialising in typical Polish, Lithuanian and Kresy cuisine, an area of Eastern Poland, this quaint restaurant from Chef Elżbieta Walczyk offers traditional recipes passed down from generations. Split over three rooms, there's a nice view over Matejko Square, an antique working stove, and a scented fireplace. Live violin and piano music play every night and the hunting trophies on the wall match the excellent wild meat dishes including venison, poultry, mushrooms and garlic. Opened in 2010, this stunning restaurant in the basement of a Nineteenth Century building in the Jewish Kazimierz area offers elegant Polish meals in a unique setting. Translated into English as "Neighbourhood", its beautiful patio garden and thematic cellars of different sizes and decoration make it ideal for everything from romantic dates for two to boisterous parties. Chef Jan Baran's restaurant is just 200 metres away from the Wawel Royal Castle and has remained popular for his friendly hospitality and fantastic Polish cuisine with local specialities since opening in 1997. A homely atmosphere, various paintings, two fireplaces and elegant professional waiters add to the experience. Located in the vibrant Kazimierz Jewish Quarter, this younger sister to the tourist heavy Szara restaurant in the main square (above) is every bit as good, if not as ornate. Boasting a French brasserie feel, the menu is largely Polish and Swedish, reflecting the owner's roots.